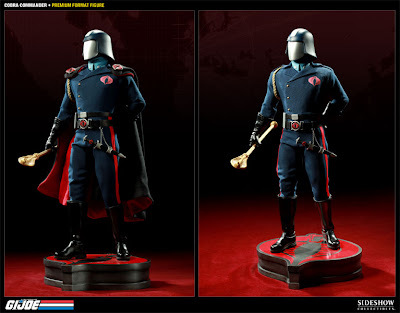 Sideshow Collectibles have posted new images of their upcoming Cobra Commander Premium Format Figure to their Production Blog. Both the exclusive and regular editions go up for pre-order on Thursday, March 10 for $299.99. The Exclusive Cobra Commander Premium Format Figure includes a switch-out hooded portrait. Discuss it in the Toy Sale Boat Forums. Other available and upcoming G.I. Joe items from Sideshow include Red Ninja 12-inch Figure - Sideshow Exclusive Version, Flint 12-inch Figure, Stalker 12-inch Figure, Cobra Viper 12-inch Figure, Flint VS Zartan Diorama, Cobra Commander Diorama, and Snake Eyes VS Red Ninjas Diorama - Sideshow Exclusive Edition.